Xiaomi has gained a significant lead over Samsung in the Indian smartphone market in the past quarter, according to the latest Counterpoint Research report. The market research firm’s findings show that while Samsung’s market share has stayed put compared to the corresponding three months in 2017, Xiaomi has widened its lead compared to the preceding quarters. It also says India’s smartphone shipments reached an all-time high in the July-September period, and accounted for half of the total mobile phone sales in the quarter. Another important point to note in the report is that buyers in India are now purchasing more expensive smartphones, with the $150-250 (~Rs 11,000-18,000) segment accounting for a third of the volumes in the quarter. Counterpoint’s latest report claims that India’s smartphone market grew 24 percent quarter-on-quarter and five percent year-on-year. It says the top five vendors account for 77 percent of the total sales for the quarter. Moreover, four of the top five brands – namely Xiaomi, Samsung, Vivo, and OPPO – registered their respective highest-ever shipments in the period. The report also claims that in the July-September period the India smartphone shipments exceeded those of the US, only the second time this has happened. 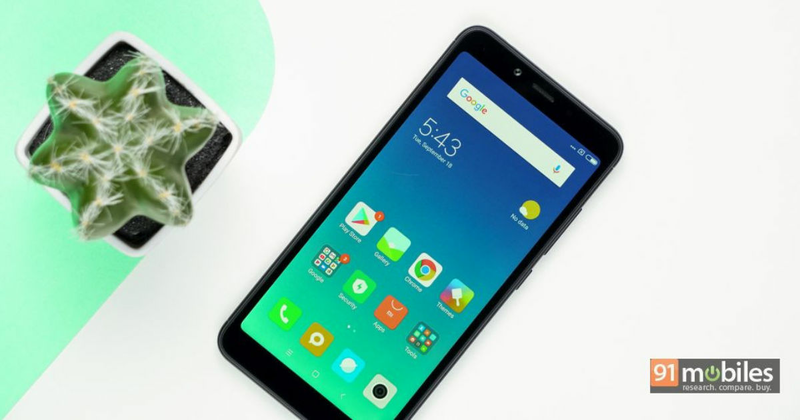 Talking about Xiaomi first, the research firm indicates that Xiaomi claimed a total market share of 27 percent in Q3 2018, up from 22 percent share during the same period last year. The brand allegedly managed to do this by driving sales from the new Redmi 6-series devices and by expanding its footprint in the offline channels. In addition, the company formed a new sub-brand called POCO, which saw strong initial shipments of the POCO F1 smartphone. Moving on, Samsung continued to be the country’s top two smartphone maker with a market share of 23 percent in Q3 2018, which is the same as in the Q3 2017. The brand’s shipments were driven by the J series devices, especially the Galaxy J6 and Galaxy J8. In addition, the vendor’s recently launched Android Go smartphone, the Galaxy J2 Core, also contributed to the shipments in the sub-$100 (~Rs 7,300) segment. The third spot on the report is claimed by Vivo, which grabbed a market share of 10 percent. The brand’s V series devices – which focus on features such as in-display fingerprint sensors, fast charging support and cameras – contributed most to the shipments. On the next spot was Micromax, back among the top five manufacturers for the first time in two years on a Counterpoint Research report. The brand claimed a market share of nine percent in Q3 2018 compared to six percent in Q3 2017. The firm states that Micromax, along with Reliance Jio, recently won an order of supplying five million smartphones to the women and students in Chhattisgarh state. So it’s highly likely that the brand’s shipments are set to decline following completion of this order of five million units. Furthermore, the report suggests that OPPO (excluding Realme) held the fifth spot in the third quarter of this year with eight percent market share, the same as its share in Q3 2017. Its sales were driven by the refreshed product line, with the OPPO F9 getting a mention. Separately, the report mentioned Realme shipments crossed 1 million units – a record for any brand in the country – and that the Realme 2 was the most popular model in its portfolio; previously, Realme had claimed the same figure. Transsion Group’s smartphone brands including itel, Tecno, and Infinix continued to grow strong last quarter. More specifically, Tecno shipments rose by 100 percent and Infinix’s increased by 65 percent, the report said. Other vendors like Honor, ASUS, and Nokia also did pretty well in the quarter. Honor 7A and Honor 9N were the popular models in the Huawei-owned brand’s lineup, and the ASUS Zenfone Max Pro M1 top variant was the among the most popular smartphones in the sub-$200 (~Rs 15,000) segment. To nobody’s surprise, OnePlus 6 has retained its position as the best-selling premium smartphone in the country.